The below artworks are the most important by Jane Freilicher - that both overview the major creative periods, and highlight the greatest achievements by the artist. Artwork description & Analysis: A green glass vase with thin stems of purple irises sits in the foreground of the painting, perched atop a windowsill. Looking out the window, which is the entire canvas, the viewer can see the close and crowded buildings of New York stretched before them. Lights flicker in windows, smoke billows out of smokestacks, clothes on lines seem to sway, and the sky turns a dusky purple. Freilicher's brushstrokes are loose and casual, which creates an impressionistic sense of the constantly changing and vibrant city, but the tones of the colors are somewhat muted, as if to suggest that at dusk the city becomes quieter and takes on a more meditative mood. Early New York Evening reveals Freilicher's keen eye for composition; the slender irises in the foreground parallel the Con Edison smokestacks on the horizon, but as art critic Peter Schjeldahl notes, "She values color and tone, over line and shape, as primary sensations of the eye," and thus avoids being overly cerebral. The hazy, diffused colors and lines seem to collapse the boundary between interior and exterior. 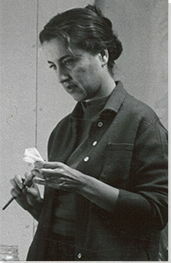 As much as it seems that Freilicher set up her easel in front of her studio window to paint the scene before her, she admitted, "I'm quite willing to sacrifice fidelity to the subject to the vitality of the image, a sensation of the quick, lively blur of reality as it is apprehended rather than analyzed. I like to work on that borderline - opulent beauty in a homespun environment." Observation and memory blur in her depiction of Greenwich Village. Artwork description & Analysis: Freilicher's penchant for painting flowers and intimate interior scenes is apparent in this early work. A large, honey-colored wicker chair fills the picture plane but is slightly off-center; diffused shades of taupes and grays comprise the background. A vibrant shawl in swirling patterns comprised of orange, blue, red, and gold drapes the back of the chair, and sitting atop the chair's seat is a glass vase filled with pink and white chrysanthemums and one single yellow rose. With the vase of flowers taking the place of a person in the chair, this piece easily demonstrates one of the most salient aspects of Freilicher's oeuvre - that she rarely includes the human figure in her interior scenes. Instead, people are merely hinted at and evoked. Freilicher wants us to imagine the person who arranged the flowers and set them there in the chair and draped the shawl on the back. Art critic Tim Keane notes that "her pictures seem to be oblique self-portraits of the painter blissfully alone in a room of her own." The alluded-to human presence along with the loose, almost frenetic brushstrokes gives the work vitality, which set her apart from some of her more cerebral, analytical aesthetic influences like Giorgio Morandi and Édouard Vouillard. Indeed, art critic Xico Greenwald says of Flowers in an Armchair, "the intimate little scene seems born of a process that flows from seeing to feeling to painting." Artwork description & Analysis: Freilicher is just as renowned for her pastoral Long Island landscapes as she is for her domestic urban ones. In Quality Farm Freilicher divides the canvas roughly in half between sky and soft grassy fields. The sky is a cloudless gray-blue, suggestive of a slight, misty chill in the air. At the horizon line scattered trees dot the landscape and frame a classic white farmhouse on the right and another roofed structure on the left. The farmhouse appears well-lived in thanks to details such as patches of foliage on the roof and the walls, an old car in the back, and laundry swaying in the breeze. Separating the viewer from the farmhouse is a large expanse of field, bright green in the center and becoming wilder and more variegated in hue closer to the viewer. 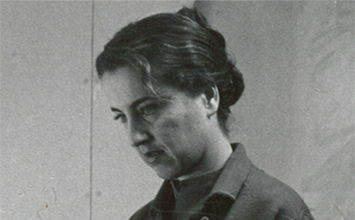 Poet John Ashbery once called Freilicher's style "a slightly rumpled realism." The subject matter is banal, and this Long Island farm isn't immune from the passage of time; however, Freilicher's style elevates the quotidian scene and offers innumerable points upon which to meditate and wonder. As Nick Obourn describes, she "borrowed the saturated pigment of the Color Field painters for her treatment of manicured grass as a thick nerve of bright, uniform, snap-pea green... [and] uses distinct, Post-Impressionistic brushstrokes to depict bunch grass and shrubbery." In its focus on a quotidian subject but one elevated by a witty, urbane eye, Quality Farm is an exemplar of Contemporary Realism - expressionistic paint handling combined with a good-natured commitment to reality as perceived by both eye and mind. Artwork description & Analysis: While most famous for her still lifes, urban scenes, and Long Island landscapes, Freilicher also painted portraits of her dear friends. Here, the poet Kenneth Koch, with the exception of his mop of dark hair, all but blends into the background. His white shirt and pale skin are similar in hue to the pinkish cream of the background and echo the soft lavenders and rose pinks in the vase of flowers to the right. Off center and juxtaposed with the vase, Freilicher's portrait resembles one of her still lifes. As one of the founders of the New York School of poets, Koch was an anti-traditionalist, known for his wit and humor. Writer David Lehman explains that Koch "takes a great deal of delight in the sounds of words and his consciousness of them; he splashes them like paint on a page with enthusiastic puns, internal rhymes, titles of books, names of friends . . . and seems surprised as we are at the often witty outcome." Perhaps Freilicher gives the viewer a glimpse of Koch's methods by making her own visual rhymes within the composition. In 1951, poet Frank O'Hara sent Freilicher an article by the intellectual Paul Goodman about the plight of the current avant-garde. In the essay, Goodman asserted that writers must write Occasional Poetry, poetry for and about their friends, in order to build an avant-garde community that would resist the alienating effects of our consumer society. O'Hara and the other New York School Poets took Goodman's call to arms to heart and composed poetry about each other, their experiences at parties, and everyday activities. Freilicher's portraits seem to be the visual equivalent of the poets' verses. Freilicher, along with artists like Elaine de Kooning, Fairfield Porter, and Jane Wilson, reengaged portraiture at a time when abstraction was ascendant in order to share the intimate, everyday relationships that connect us to the world. Artwork description & Analysis: Twelfth Street and Beyond is classic Freilicher - a comfortable, warm still life of objects in her apartment in the foreground and a window looking out onto the densely clustered buildings of lower Manhattan in the background. The eye-catching fuchsia linen that drapes the small wooden table is anchored by a central plant, whose verticality contrasts nicely with the horizontality of the table and mirrors the buildings behind it, a small porcelain mug, a blue pitcher, a can of paint, and a small glass mug filled with sprightly red and yellow flowers. Her brushstrokes are strong and crisp, less expressionistic than earlier works. Freilicher's still lifes make a case for their being, as her friend John Ashbery wrote, "miniature cosmogonies: all things in them co-exist and allowed their idiosyncrasies." In her patient, thoughtful rendering of objects she creates works that, as critic Tim Keane writes, "achieve a transfiguring of the everyday...through representations of reality that painstakingly reenact the processes of perception. Natural and manmade objects seem to unfold themselves through an internal artistic agency all their own." The objects on the table have a subtle but mesmerizing push-pull relationship with each other (perhaps something she picked up from her former teacher Hans Hofmann, albeit used for the purposes of representation instead of abstraction) and assert their own individuality; critic Jenni Quilter calls them "optimistic and fierce, just as unconcerned and confident as the detailed cityscape outside the window." Artwork description & Analysis: Though Parts of a World is similar in subject to many of Freilicher's other work in that it consists of a still life in the foreground and a cityscape in the background, its collection of objects, muted colors, and abstracted painterly style differentiate it from others. The buildings in the background are in hushed shades of salmon, ochre, and taupe, and a hazy white mist obscures their lower parts and seems to meld into the still life scene in the foreground. On the table rests a blue and white porcelain bowl, a decorative white dish, a plate with four silver sardines, a small earthen vase with two slender white orchids, and a slender, small statue of the Venus de Milo. The objects anchor a luminous gossamer textile to the circular marble table, but the perspective is just slightly off, slightly tilted; it is as if the veil is slowly slipping off the table into the viewer's space and the objects will eventually tumble. Freilicher named this work after one of Wallace Stevens's collections of poetry, and indeed, there is something poetic in the juxtapositions of the different pictorial elements. The objects, critic Jenni Quilter writes, "get along comfortably enough, though we cannot be entirely sure of the intention of the arranging hand in all of this." Though Freilicher had no stated inspiration from the Surrealists, there is something of Giorgio de Chirico or Rene Magritte in the objects - the dead fish, the living orchids, the miniature female figure, the statuesque, lifeless cityscape. Critic Katherine Beaman also finds the scene somewhat discomfiting, calling it a "vacant" painting. She notes that "the proportions don't seem quite right. There's something off, as if a hint toward lucidity while dreaming" and that while there are no humans in the scene, the selection and arrangement of the objects hints at their presence. What viewers are left with is the sense that Freilicher wanted to create a specific mood here and found the best way to express it was intimation of presence through absence. Artwork description & Analysis: Freilicher continued painting to the very end of her life, exploring the same subjects but approaching them from different perspectives and states of mind. Window juxtaposes interior and exterior as do many of her works, contrasting the soft, vibrant flowers in their vases and pitchers with the rigid, geometric formation of the city buildings in the distance. Her color palette is muted, ethereal; the eye is drawn to the yellow blooms but even those are subdued. The entire scene is suffused with a soft mistiness, filling the gray-blue sky and settling over the flowers on their sill. The overall impression of Window is quiet, meditative; if the viewer chooses to read into the nonagenarian's mindset when composing this work, it seems to be one of peace and contentment with a life and career well-lived. Critic Stephen Westfall admires Freilicher's "distinctly personal relationship to these genres, leaving us in no doubt that these are her interiors and landscapes, her rooms with windows and the views beyond." At the same time as she makes her pieces personal, however, Freilicher also continues to call on her decades-long inspirations of Morandi for structuring and relationships between objects, Vuillard and Bonnard for their lush depictions of florals, and the Cubists for their organization of the picture plane into disparate but united sections. In fact, critic Franklin Einspruch calls Window "the most overtly Cubist work" in her later years, noting how "the vases divide the windowsill into vase-size units, turning the lower quarter of the painting into an evocative abstraction."